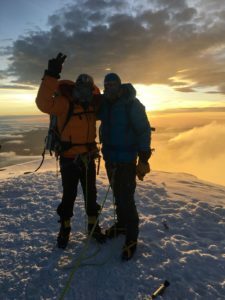 Stay tuned for more photos and updates for their Rapid Ascent climb of Cotopaxi (19,347′ / 5897m)! And for questions on any of our expeditions or courses please contact us at info@alpenglowexpeditions.com and 877-873-5376. Cotopaxi - My very first mountain that I climbed. (1990) Did it on a whim. Bought some crampons, an ice axe, and goggles and off I went. Got to the refuge at noon, left for the summit at midnight. Back by 10:30 am. Oh to be young again! I should clarify my earlier comment. There was a whole more to the climb of Cotopaxi than I let on. It was the hardest thing I had ever done to that point in life. Being foolish and young, I was not prepared, nor did I know how hard it would be or know any safety guidelines. If you are lucky enough (and smart enough) to hook up with a climbing company - do it!